His instructions allowed me to get started on my 2 columns that needed work. I would have been lost without his page. The first one I did was already removed from the car, so that's the one that I took the photos of. I'll address doing this in the car at the end of the page. 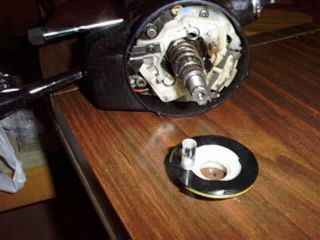 Here's the floppy old column sitting on the table with the wheel removed, just waiting for someone to start on it. The first thing to do is remove the lockplate. That's the windmill-looking thing in the center of the column. I've got a lockplate tool in place, compressing the spring so I can get to the retaining clip. Do yourself a favor. Buy or borrow one of these tools for this job. I got this one at AutoZone for $7.95. It was worth every penny. 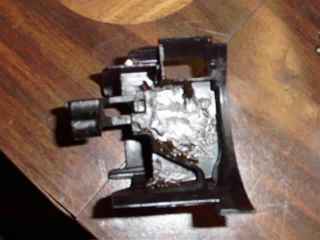 Here are the lockplate and its retaining clip after removal. Here's the cancelling ring removed. The large compression spring on the shaft will have to come out, too. Then you remove the phillips head screw that holds the turn signal lever bracket in place. There are 3 phillips head screws that hold the turn signal assembly in place. Remove these and pull the wire harness up through the column housing so that the assembly can be moved out of the way. This is a lot easier when the column is out of the car, but it can be done with it still in. Don't forget to remove the hazard flasher switch knob. There's one phillips screw inside it. And don't lose the spring inside the knob. 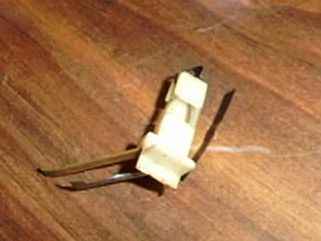 Use a pair of needle nose pliers to remove this switch and its retaining spring. Don't let the spring sail into low earth orbit. They're hard to find. 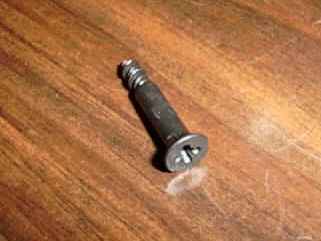 This is the screw that retains the lock cylinder in place. 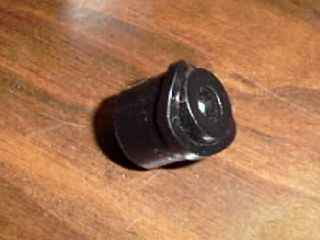 It might be a phillips or T-20 Torx head (PosiDrive, maybe?) Remove this screw and then pull the lock cylinder straight out of its housing. 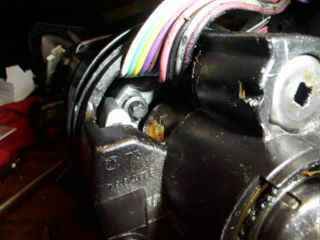 Now might be a good idea to replace the lock cylinder if it's worn. It made a big difference in my El Camino. These are the 3 #30 Torx screws that hold the housing in place. Remove these and the housing will be ready to fall out in your hand. When you remove the housing, the smaller housing for the tilt lever will leap off when you're not looking. 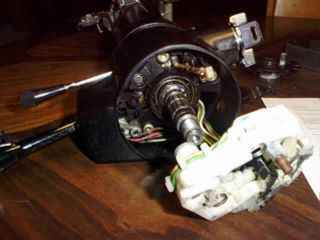 And then the dimmer switch actuator will come off and you'll wonder how in the heck it goes back in. Well, this is what it should look like as it gets reassembled. In this photo you can see one of the culprits. 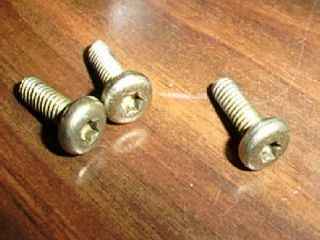 These are the bolts that loosen up and cause all the grief. They take a size E8 reverse Torx socket. I had to use a 1/4 inch extension to get to them. I don't think there is enough room for a 3/8 extension. Now here's the semi-posterior (half-assed) part. There are 4 of these bolts, but only 2 of them are accessible without REALLY tearing things apart. I did an informal poll of people who had tightened up their columns and a couple of mechanics who do this for a living and the overwhelming majority said that they usually only tightened up the two accessible bolts. So in the two columns I just did, I used this method. So far, so good. Here's a closer view of the little darlin'. This is your friend. 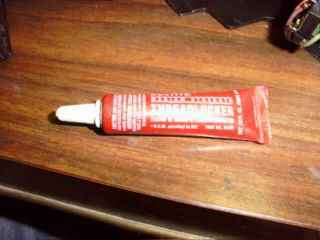 Loctite. Coat the threads liberally before tightening the loose bolts (you'll want to take them all the way out) and if you've said the right magic words, you won't have to do this again for a LONG time. Why, it's just the reverse of dissassembly, of course. Yeahright. There are a couple of things to watch for. 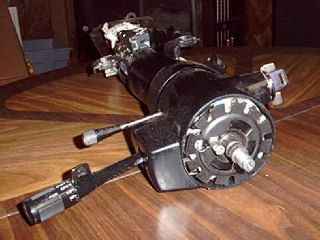 The dimmer switch actuator is a little difficult to line up, and it can go together wrong. I know. 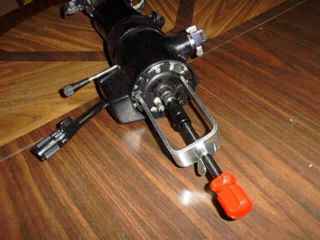 Make sure that the oddly shaped end of the actuator (on the left in the photo) slides up through the main housing and is free to be moved by the arm on the turn signal lever. 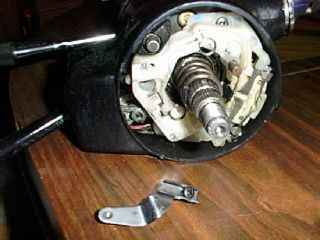 Another thing to check is that the lock stud spring doesn't get caught in the housing when you're putting it back on. If you do this, one of two things will happen. Either the "Start" position of the lock assembly won't spring back or the steering wheel lock won't work when you put it all back together. If you don't already have the column out of the car, you can do this without having to pull it out. 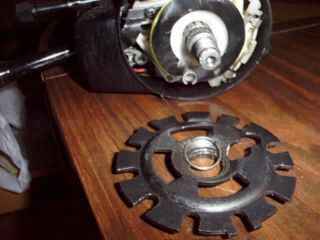 The only additional steps are to disconnect the battery, remove the access panel under the steering column (4 screws) and then lower the column by removing the 2 nuts that hold it against the dash assembly. 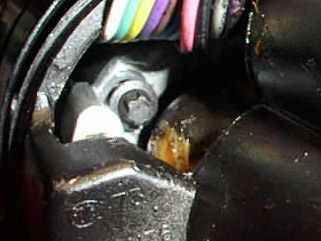 Then disconnect the turn signal harness at its connector so that it can be pulled up through the column far enough to slide out of the way. The rest of the procedure is the same, whether it's in the car or out. You don't have to disconnect the column at the rag joint nor remove the screws fastening the column to the firewall.